The piece opens with what “Inside Edition” described as Liberty Mutual and Allstate ads promoting the convenience of photo estimating, including one in which the fictional body shop apparently threw liability to the winds and let three children and a mother wander around the shop floor willy-nilly. 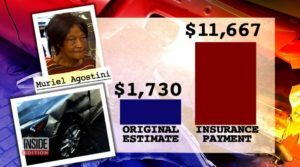 “Inside Edition” covered 85-year-old Muriel Agostini, who received an approximately $1,700 photo estimate for what Allstate ultimately agreed was a $11,667 repair. An email request seeking comment about the report has not yet been returned by Allstate. Reporter Lisa Guerrero said collision repairers told Inside Edition insurers know customers will just cash the checks unaware by how low they are or the “safety” and “liability” issues Jesberger said could be overlooked. “I would challenge your premise,” he said, arguing that insurers want to put safe vehicles back on the road. From a theoretical perspective, Barry’s point about the comparability of a photo estimator and a in-person adjuster has merit. Both are equivalent in the sense that neither is a substitute for having the shop write the estimate of record. It’s unlikely that even an adjuster examining a vehicle exterior in person would produce an initial estimate as accurate as a collision repair professional who’s scanned, measured, torn down and blueprinted the vehicle armed with OEM repair procedures. As Allstate has said, the same supplement process can and does take place under a photo estimate as would occur under a traditional in-person estimate. • The adjuster’s estimate is a benchmark, not a total claim payment. The insurance company will not expect you to accept their adjuster’s estimate until you’ve established to your own satisfaction that it will cover the cost of repair, so don’t feel pressured. After all, the insurance estimate isn’t meant to be the instructions for fixing the car — that determination (based on OEM repair procedures) and the liability for its outcome falls squarely on the collision repairer. Instead, the insurance company’s estimate is really only valuable internally. It’s a means for the insurer’s accounting and finance team to gauge how much money they’ll need to set aside to cover the claim. However, whether it’s responsible or ethical for an insurer to cut a check prior to the true vehicle repair expert — the body shop — evaluating the car’s condition is a fair concern. 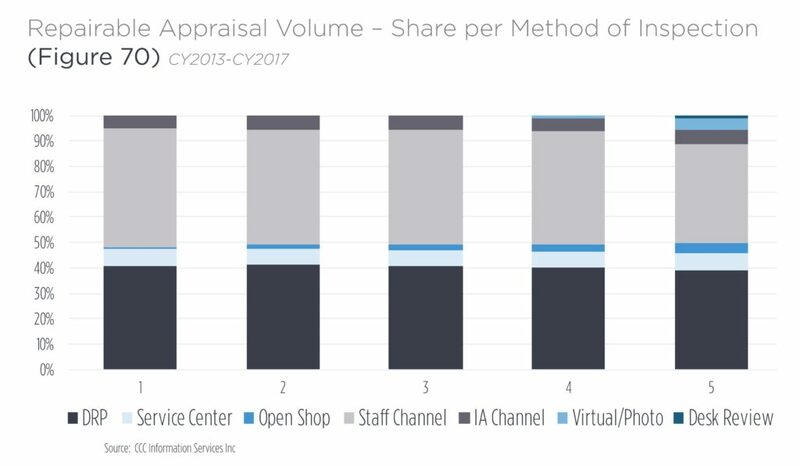 Certain customers are probably going to take the money and run regardless of if a desk reviewer, photo estimating AI, human appraiser or auto body repair professional writes the first estimate. But if insurers know some options might lack the accuracy of an estimate written by a body shop or even an in-person adjuster, is it fair to tempt such customers with a check likely to be less than they’re owed? Worse, if the ability to evaluate whether the car is unsafe to drive — and communicate that information to customers — suffers without an in-person evaluation of the vehicle, is that responsible or ethical? Auto Body Repair Network in 2016 reported Massachusetts’s Auto Damage Appraiser Licensing Board approved photo estimating in 2014 but retracted it 14 months later. The report carried an anecdote by member Rick Starbard, a shop owner, suggesting that in-person adjuster estimates might indeed be more accurate than photo estimating. An insurer on the ADALB said a photo estimator could deduce when additional damage could exist and the vehicle should go to a shop, a notion Starbard dismissed as a “perfect world” scenario failing to occur in reality, according to ABRN. One final point: Shops who do criticize photo estimating should make sure to ensure they’re criticizing the right concerns with the process. We’re a little confused by complaints by shops that a lack of photo estimating accuracy means they’re “doing the insurer’s job” by having to determine the true damage on a vehicle. A shop — the actual repair professional incurring all the liability — should always be producing its own estimate anyway and work off of that, a legal expert has advised. Nor should they generally rekey an insurer’s estimate, experts advised. By that logic, the source and accuracy of the initial insurer estimate ought to be irrelevant for a repairer, aside from the KPI hassles it might pose to direct repair program shops obligated to accept and supplement it. The true concern remains customers being misinformed about vehicle safety and failing to receive the compensation they truly deserve for the loss — the points Inside Edition made to a national audience last week.